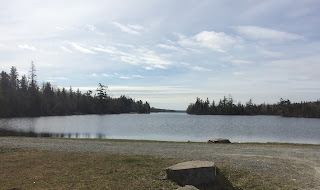 This April my wife and I found ourselves out in Nova Scotia visiting family. 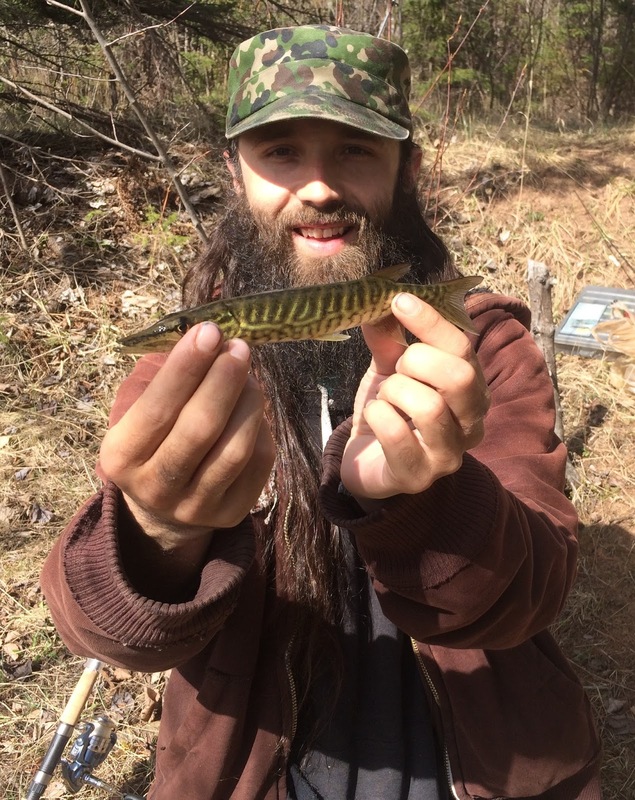 A few opportunities arose for some fishing and although weather and season wasn't ideal, we made the best of it. Being a flat-lander and resident of Manitoba, I am very familiar with the local term for walleye being "pickerel". Contrary to popular belief a walleye is not a "pickerel" and that sparked an interest in catching a true chain pickerel as they are not native to Manitoba. They are an invasive species in Nova Scotia and some lakes are out right "polluted" with them according to some locals and with the ice off the lakes and season open, I was going to try my damnedest to catch one. We arrived at our destination lake a few hours after sunrise, there was minimal wind and the sun was out, however the mercury was barely breaking 5 degrees Celsius. The only available shoreline of the lake was the northern most bays and I had high hopes of fish basking in its warmth. The water was crystal clear and we could see a great distance but its temperature was a little cooler than I had anticipated. I set my wife up with a marabou jig and myself a small 5 of diamonds spoon and we got to casting and covering the available shoreline. An hour had passed with many casts and a few lure changes with nothing to show for our efforts. A few locals had come and gone as well having similar results. It became clear that the lake still needed some time to warm up, at least for those stuck fishing from shore. Not to be discouraged, we continued casting and working our way back to where we started. I spent a little more time on a beaver lodge I was sure could hold fish and finally got a familiar tap on the end of my line. A fish was hooked, but a fight there was not. 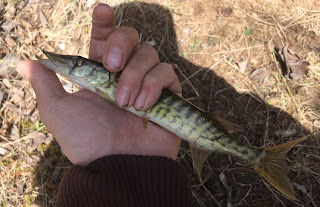 There was barely any weight to this fish but I didn't care as my first chain pickerel was to shore. It wasn't a two footer like I had hoped, but it was a new species and I was ecstatic. We continued fishing for another hour or so, again with nothing to show for our efforts and with places to be and things to do, we cut our angling session short. It wasn't a giant success, but complete failure was diverted and if opportunity arose to target them again, I definitely would. However with plenty of other angling options throughout Nova Scotia, I think it might be a while before I try again.